Thanks to the many business leaders from the Greater North County Chamber of Commerce who stopped by Trinity High School on Wednesday evening for appetizers, beverages and networking at the monthly "Business After Hours" Check out more photos on the Chamber's Facebook Page. St. Angela Merici’s fourth graders are aiding in the saving of the Monarch Butterfly. Their butterfly house in their classroom had 10 caterpillars and the students released ten butterflies. This was a successful saving of a beautiful creation of God. The fourth graders also took time to find more beauties of God. Our world is awesome – including each of us made to the image and likeness of God. In science class, fourth grade students at Christ Light of the Nations School have been learning about vertebrates and invertebrates. A few students brought in perfect examples of exoskeletons of arthropods. The students shared the exoskeletons with the class. 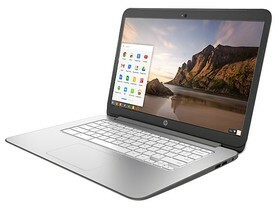 Classroom Chromebooks are a new addition to the technology tools at St. Norbert School this year. Teachers are using them in a variety of ways to enhance their lessons. For example, in Mrs. Lightner's Religion class, they use YouTube to listen to Christian songs, making connections to the students' morality chapter. 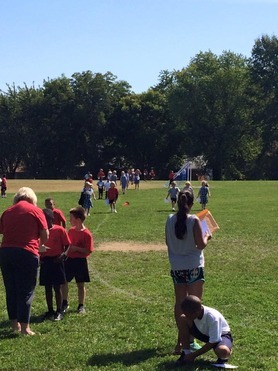 Students at St. Rose Philippine Duchesne walked over 1,500 miles in their annual Walk-A-Thon. Scheduled during ITBS testing week, kids get a break from their desks and set a goal for how many laps they will walk during PE class and lunch recess. This is also a fundraiser, students seek pledges which help provide and enhance technology tools for the school. Which classroom will win the annual "Golden Shoe" award for walking the most miles? The winner will be announced at an ice cream party in October. Catholic schools had a special reason to celebrate last week, as they learned more about Pope Francis and his historic visit to the United States. At Our lady of Guadalupe School, students and staff have been very excited this week about the arrival of Pope Francis. The boys and girls have learned many things about our Holy Father and are coming to know him as our shepherd and our friend. We know that he reaches out to the poor, the sick, and to anyone who needs help. We know that he looks after people who have nowhere to turn. He teaches us to welcome immigrants, work for peace, protect our environment, and cherish our lives and the lives of all other people. Pope Francis is our teacher and our pastor. He truly lives by the words of his patron, Saint Francis who said "Lord, make me an instrument of your peace. Where there is hatred, let me sow your love; where is is injury, pardon; where there is despair, hope; where there is darkness, light; And where there is sadness, let me bring joy." 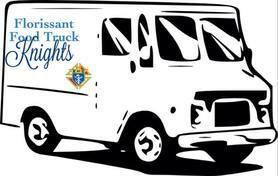 XLT night this Thursday - 10/01/15 at St Martin DePorres 7-8:30pm! 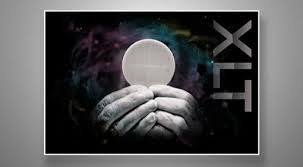 Need a little focused time with Jesus? How about some dedicated prayer time with your NoCo faith community? Spend some time in praise and worship with the music of Sacred Heart's contemporary group and listen to a message from our charismatic guest speaker, Kathleen Govero! A little food and fun to follow of course! See you there! 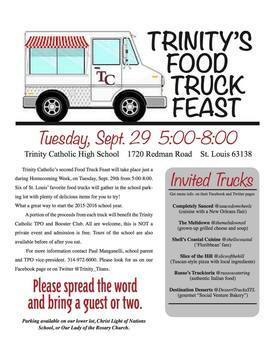 Trinity Catholic High School is holding their annual fall FOOD TRUCK FEASTTONIGHT September 29th from 5:00 – 8:00. This is part of our Homecoming Week festivities and is open to everyone. 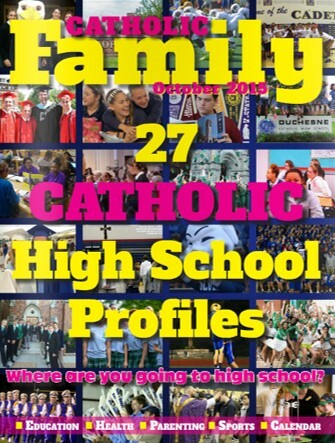 We would especially love to see all the Trinity, Aquinas, Rosary, and Mercy alums! The trucks scheduled to attend are: Completely Sauced, Destination Desserts, The Meltdown, Shell’s Coastal Cuisine, and Slice of the Hill. It’s going to be a fun evening and we hope to see you all there. 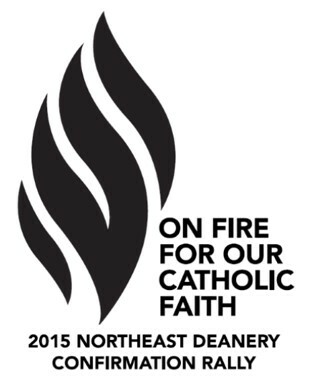 The 11 parishes and 8 schools of the Northeast Deanery are vibrant and active, with many events that bring parishioners, families and friends together in faith and fellowship. Each parish publishes details of their upcoming events in their weekly parish bulletins, which you can access online by clicking on the parish names below. Check out happenings at other local Catholic organizations, too (listed at the bottom). A few highlights are listed. Click on the parish name to view their weekly bulletin. October 3 at Noon - BTC Fall Festival - Games, Rides, Inflatables, Chicken Dinner, BBQ, Funnel Cakes, Basket Raffle, Quilt Raffle and More! Check bulletin for details. October 2, 7-10pm – Christ, Light of the Nations families will gather for a Family Trivia Night sponsored by the CLN PTO. October 16 - Friday Movie Night featuring "October Baby"
September 30, 7-8:30pm – Have a "Heart to Heart" with God - Fr. Joe Laramie, S.J. presents on the Jesuit "Examen" prayer. October 24 – St. Ferdinand Music Trivia, 6pm Doors, 7pm Trivia – $20 per person, call 313-1146 for reservations. October 3 - Munch 'N Movie Night - after 4:30pm Mass - bring lawn chairs and drinks and watch "God's Not Dead" with St. Martin de Porres parishioners. October 4, 7-9p - Fusion Youth Group for high school students - meets every Sunday in the Grady Room at St. Norbert - contact Chris Meyers for more information, 314-831-3874 x243. Here are some additional happenings in north county that you might be interested in joining with your family! 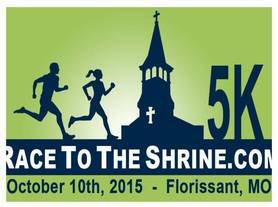 Look for our Federation of Catholic Schools table with kids activities! The St. Louis Review has lots of coverage of Pope Francis' historic visit to the United States last week. Click here for more information.